Sears understands how important cleanliness is to you. We also understand that sometimes you are just too busy with life to clean your home yourself. That is why Sears Maid Services employs only experienced cleaning professionals for every commercial and residential job. Whether you need a deep cleaning to prepare for guests or something more regular, you can rely on Sears professionals to provide a clean you can be proud of. From bathrooms and kitchens to conference rooms and hallways and everything in between, we take great satisfaction in doing an exceptional job. Plus, we specialize in hard to reach and often forgotten items, like ovens and ceiling fans. Find out for yourself how Sears Maid Services can lighten your load and improve the quality of life in your home. Learn firsthand why Sears has been trusted for all kinds of home services by people just like you for over a hundred years. Give us a call at (305) 515-2636. Everyone needs help from time to time. A new baby, surgery, or even a hard-won promotion can change your schedule in unanticipated ways. Rather than spending your precious free time cleaning your home, spend it with the people you love and let Sears Maid Services do your housekeeping. Our well-qualified staff will work around your schedule, providing you with the housekeeping services you need at times that fit your life. You can also call on us for those periodic major cleanings, like spring cleaning and pre-holiday cleaning. Our Deep Cleaning service includes the same tasks our ordinary cleaning includes but with an added emphasis on difficult areas. When you choose Sears, you are getting more than a century's worth of expertise and professionalism. Your offices and sales floor speak volumes to your customers, clients, and employees. A clean, well-organized space tells the world that yours is a company that pays attention to detail and expects high levels of competence from its employees. Make sure your office space communicates who you really are. Let us show you how Sears Maid Services well-trained employees can keep your conference room, your break room, and your offices dust and clutter free. Construction creates a lot of dust and other indoor air quality issues that must be addressed before you can occupy your home. Sears Maid Services has the specialized cleaning knowledge needed to properly clean up after the construction crews have gone. Whether you are dealing with new construction or a remodel, our crew has the experience necessary to thoroughly clean your home of the allergens and chemical residues often associated with construction sites. Before you move in, let Sears Maid Services give your home a thorough post-construction cleaning to ensure that your home is as healthy as it is beautiful. At Seas, we understand the discomfort some feel with allowing a cleaning service access to their home. That is why all of our employees must pass a background check and other rigorous screenings as part of the application process. Before they are hired, all employees are vetted for professionalism and responsibility. Choosing Sears means choosing trustworthy people who will clean and take care of your home as if it were their own. Our professional cleaning teams take pride in doing their job well. 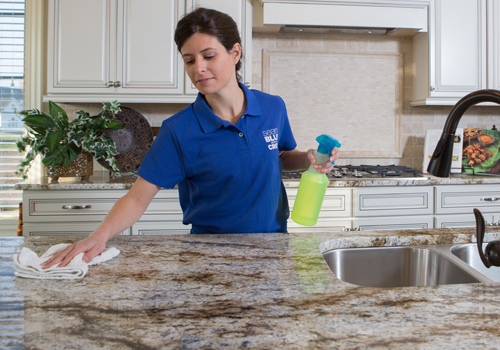 Our comprehensive training ensures that your home or office will be cleaned right every time. We are so sure of our cleaning crews and the results they provide that we guarantee their work. If you are not satisfied with our cleaning services, call our offices within 24 hours of the original service time, and we will make it right. With the Sears Maid Guarantee, you will be completely satisfied with our services or we will come back and do the job again until you are.